Creating and delivering quizzes and tests online offers a number of advantages over paper-based quizzes and tests. Many online quiz services allow you to create quizzes that give your students instant feedback. Some of the services provide the option to include picture and video prompts in your quizzes. And all of these services save you the hassle of printing your quizzes. Here are seven ways that you can create and deliver quizzes online. Blubbr is a neat quiz creation service that you can use to create video-based quizzes. Using Blubbr you can create interactive quizzes that are based on YouTube clips. Your quizzes can be about anything of your choosing. The structure of the quizzes has a viewer watch a short clip then answer a multiple choice question about the clip. Viewers know right away if they chose the correct answer or not. To create a quiz on Blubbr start by entering a topic for your quiz. After entering your topic enter a search for a video about that topic. Blubbr will generate a list of videos that you can select from to use in your quiz. When you find a video that works for you, trim the clip to a length that you like then write out your question and answer choices. Repeat the process for as many video clips as you like. Click here to try a short Blubbr quiz about the human heart. Zoho Survey is a feature-packed tool for creating online quizzes and surveys. Zoho Survey allows you to mix and match 21 response formats while you're creating your surveys. Within those response formats there are additional features you may find useful. For example, you can specify a maximum number of characters entered in an open-ended response field. You will also find that you can apply "if then" logic to any response field. This means that you can ask a short answer question and send respondents to a new question based upon their responses. For example, I could ask students to enter which class they're in and send them to a set of questions just for their class. (This can also be done in Google Forms but only if you use multiple choice responses). When you're ready to publish your Zoho Survey you can embed it into a blog post or webpage. You can also send out a link to your survey. One of the options that you can choose for your published survey is to limit responses to one per computer. Another useful option is to set a date to automatically stop allowing responses. Quizdini is a free tool for creating online quizzes. The best feature of Quizdini is that you can create explanations of the correct answer for your students to view immediately after trying each question in your quiz. Your explanation can include text and or links to online resources like videos and images. 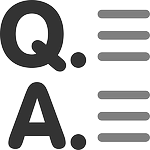 Quizdini quizzes can be created in a traditional linear format or in a matching format that asks students to pair answers to terms. ImageQuiz is a free service that allows you to create quizzes based on any images that you own or find online. When people take your quizzes on ImageQuiz they answer your questions by clicking on the part of the picture that answers each question. For example, if you uploaded a picture of a map you could write questions that ask users to click on states, cities, or countries. Creating a quiz on ImageQuiz is an easy process. First, give your quiz a title and then upload a picture or copy and paste the URL of an online image into ImageQuiz. Then draw outlines around the parts of the picture that will be the answers to your questions. Finally, write your questions and try your quiz. To share your quiz just give people the URL of your quiz. You can try my sample quiz here. Socrative is a free quiz/ survey tool that I've been using a lot over the last couple of years. Socrative replaces the need for expensive proprietary clicker systems in a classroom. Socrative allows me to create single question and multiple question quizzes with multiple choice and or open-ended responses. My students take the quiz on their iPads, Android tablets, or laptops by signing into my Socrative room number and completing the activity that I have cued-up in the Socrative virtual room. Socrative allows you to collect responses anonymously or with the requirement that students enter their names. Students don't have to create an account to participate in any of your activities. To participate they simply need to enter your Socrative room number when they visit m.socrative.com on their laptops, iPads, Android tablets, or any other device that has a web browser. Infuse Learning is similar in concept to Socrative with a couple of differences worth noting. First, Infuse Learning allows you to create multiple rooms within your account. That means you can create a different Infuse Learning room for each of your classes rather than re-using the same room for all of your classes. Second, Infuse Learning allows you create questions that your students draw responses to. This can be particularly useful in a math classroom because your students can simply use a Stylus to hand-write their solutions to problems rather than trying to figure out how to type and format all of the symbols used in a math problem. I couldn't create a list like this without including Google Forms. Using Google Forms you can create multiple choice, true/false, and free response questions quizzes. The latest version of Google Forms allows you to include videos and pictures in your quizzes. If you use the multiple page option in Google Forms you can send students to a new section of your quiz based on their answers to a previous question. Finally, by using a script like Flubaroo your quizzes can be graded for you and the grades can be emailed directly to your students.